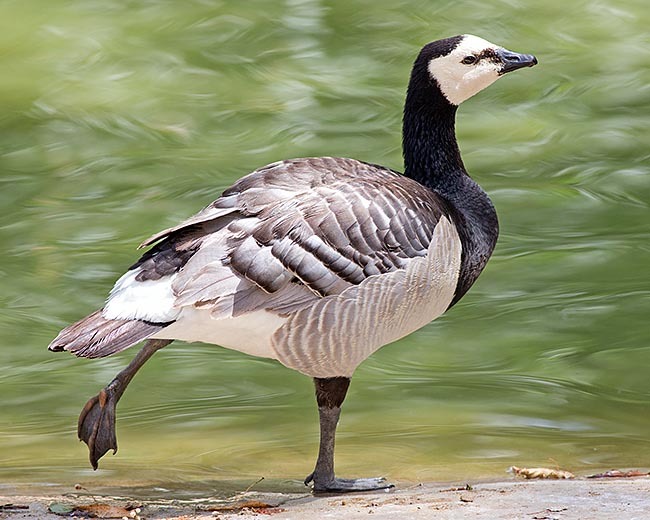 The Barnacle goose (Branta leucopsis Bechstein 1803) belongs to the order of the Anseriforms (Anseriformes), to the family of the Anatids (Anatidae), to the genus Branta and to the species Branta leucopsis. The name of the genus “branta” probably comes from the word in Old Norse “brandgàs” which means “burnt goose”, with reference to the dominant colours of the geese belonging to this genus. The name of the species “leucopsis” comes from the Greek “leykos” = white and “opsis” = look, appearance, with reference to the white face typical and distinctive of this species, so much to give it the name if white-faced. It is an Arctic monotypic species with quite restricted distribution, with three separate populations, of which two are present in the western Palearctic region. Two populations (eastern Greenland and Spitsbergen) winter in Great Britain and Ireland, even if in distinct areas. The third population, Novaya Zemlya-Vaygach, winters in Holland and northern Germany, with limited presences in the North Sea and in south-eastern England. It has an accidental or irregular appearance in France, Spain, eastern Germany, Poland, Czechoslovakia, Hungary, Austria, Switzerland, Yugoslavia, Romania, Italy, North Africa (Egypt, Morocco), and Acores. Like other species of geese bred for amateurs purposes, there is the possibility that a certain number of reports, especially out from the winter period, may be referred to individuals of non-wild origin. During the reproductive period, it frequents swamps, valleys, hills and especially arctic islands and coasts, preferring the rocky ones, rocky headlands and step to slopes, in mountain districts of the Arctic, than the flat tundra. Since 1970 they have discovered colonies nesting in low grassy islands and coasts of the Baltic. In the wintering quarters, it stays in swamps, prairies, dunes close to the coasts and, rarely, in the hinterland. Medium-sized goose, with similar sexes and seasonal liveries: total length of 58-70 cm, wingspan of 132-145 cm and weight from 1200 to 2100 g with the males generally bigger than the females. It is characterized by clear and dark contrasting hues and by a short, small and slender beak (26-33 mm long with about 30 denticles), of black colour. Distinctive, both in adults and juveniles, is the white or cream coloured spot drawing typically the face and that stands out from the black of the back part of the head, of the neck and of the upper chest. The head, as we said, is white-cream (at times a little fawn) but the back vertex, an irregular line which goes from the beak to the eye and the zone around the eye which are black. Some white feathers of the cheeks may have black apex. The long and rather thin neck, the mantle and the upper chest are dark black. The zone of the lower mantle and most of the coverts are barred: the feathers of these zones are grey with a wide black sub-terminal belt and a narrow white sub-terminal one. The rump is blackish. The tail (118-140 mm long) has black rectrices; the upper coverts of the tail reach the half and the lower coverts reach the three quarters of the same. The coverts of the tail, the sides of the rump and the abdomen are white. The lower-lateral parts of the body are silvery grey strongly barred of grey-brownish and white on the sides and flanks. The thighs are black with narrow white apices of the feathers. The paws have the tarsus about 62-80 mm long and black as well as the feet. The wings, rather wide, measure 384-450 mm and have the primary and secondary feathers with black apices. The axillar feathers and the lover coverts of the wings are grey-pale ashen, then darker grey and slate grey-blackish proceeding from the inner part of the wing and continuing towards the dark apices, seen from below, of the remiges. When flying, seen from far away, the white face is surprisingly difficult to be seen; more visible is the strong contrast between the black of the chest and the whitish abdomen. In the juveniles the white of the face is less pure and the rest of the plumage, less distinctly contrasted in the colours, is duller and shaded of brownish and greyish. The iris is dark brown. The barnacle goose has flight and behaviour similar to those of the similar species belonging to the same genus “branta”: it is markedly gregarious, in particular with its own kind. It is maybe more confident and has more terrestrial habits than other similar geese, like, for instance, the Brant goose (Branta bernicla). It often nourishes during the night. It eats grasses and buds of various herbaceous species, mainly graminaceous and leguminous. It eats also seeds and small molluscs and crustaceans. The barnacle goose emits vocalizations resembling mono-syllabic barkings, also in chorus, and while flying. During the reproduction period they can be heard emitting some “arch”, “gnuch” and “kaw” often repeated. It nests on rocky ramparts along the banks of the rivers and in the estuaries for protecting the nest, rendering the same inaccessible to the attacks of the arctic fox (Alopex lagopus). The species is monogamous and the nesting take place in more or less numerous colonies. At times, they make the nest inside areas occupied by colonies of nesting marine birds. Other times, the nest close to the nests of Gyrfalcon (Falco rusticolus) in order to avail of the indirect protection offered by these last; like the Red-breasted goose (Branta ruficollis) which nests close to the Peregrine falcon (Falco peregrinus). The nests are prepared in cavities of the ground and on rocky ledges reachable in flight; they are formed by mosses, grasses, lichens and are sheathed in abundant down. The same nesting sites are at times used in successive years. The eggs are spawned from May to June in number of 4-5 (3-6) and are incubated only by the female for about 25-27 days. They are white-slightly greyish, dull and not glossy, have average dimensions of 76 per 50 mm (68-82 x 46-52 mm) and average weight of the shell of 10 g.
Little after the birth and as soon as dried, the chicks, if born in one of the nests placed on high rocky ramparts, must immediately meet a great test of bravery. In fact, incited by the parents, the must jump off for reaching the flat lands below and quickly gain the water which offers protection against the attacks of the arctic fox. The jump of the newborn ducklings into the void is spectacular, exciting and heartbreaking at the same time. The chicks jump flattening the body at the maximum and widening the tiny wings and the webbed open paws in order to offer the maximum possible resistance to the air. During the fall they often bounce on the underlying rocks and prominences before reaching the plain. Thanks to their morbid down and lightness, most of the chicks fall on the ground even from vertiginous heights without any damage. However, some of them die directly due to the crash or due to the wounds eventually incurred. Once reached the flat soil, immediately begins a second dramatic race against the time: the chicks, accompanied by the parents, must run as fast as possible in order to reach the water and consequently the salvation before that the arctic foxes perceive their movements and their presence. The arctic foxes if they sight the clutches of the barnacle geese catch all the chicks they can hold with their jaws for taking them to their own cubs or for eventually burying them as food storage. The protection of the eggs and of the chicks by the parents is so much demanding that during this period the parents may lose up to the 30-40% of their weight. The chicks, wholly covered by down, have the upper parts of the body of grey-pale brown colour with three pars of small whitish spots on wings and back. They have a black line on the parts between the eye and the lateral portion of the base of the beak and around the eyes, a roundish brownish spot on the vertex of the head; the remaining parts of the head are pale yellow. The lower parts of the body are very clear fawn-whitish with a brown band on the upper part of the chest. Overall, the chick livery seems faded. The beak, paws and feet are black-oil grey. The iris is brown. The young, by the rapid growth, will be able to fly when about 40 days old. The juveniles will perform the first migration with their parents with whom they will stay also till the following reproductive season. 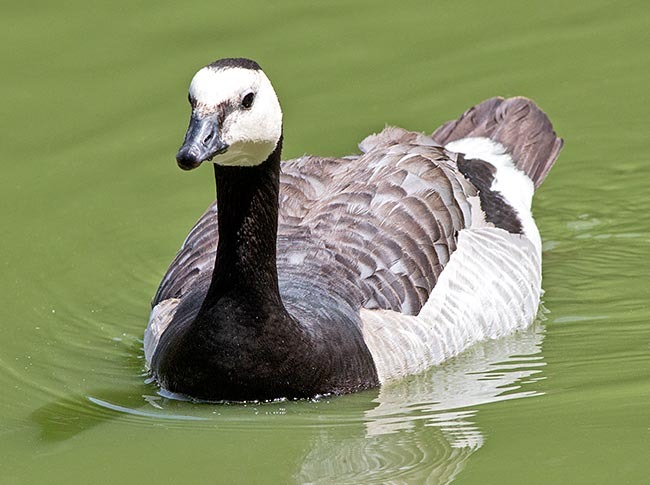 In the British islands and in the Netherlands the barnacle goose is at times persecuted by the local countrymen due to the damages it causes to the cultivated fields. For this reason, the species is protected with compensation measures to the countrymen and with plans promoting the sustainable acceptation of the species in the countries. In the wild, this goose can live up to 25 years and, in captivity, even up to 30. Anas leucopsis, Anser leucopsis, Bernicla leucopsis.